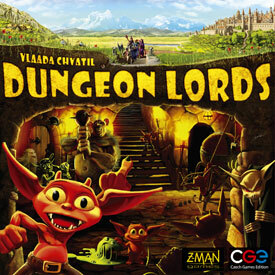 Dungeon Lords is 90 minute long game for 2 to 4 players. Itâ€™s rather complex game enjoyable mostly for experienced gamers. Dungeon Lords is a very challenging and fun game. At first glance, the typical dungeon delving theme (admittedly, reversed so you are in charge of the dungeon), paired with the artwork may lead some to assume this will be a lighter game, but this is actually quite the brain burner. Having to track when (and how much) will be due for taxes (or 'payment' to your minions) forces players to keep a fairly long range view in the game. There's a lot of jockeying for positions and having to predict what actions your opponents will be taking (and how they prioritize the actions they do take). And then there's an entirely separate sub-game for dealing with adventurers when they do invade your dungeon. The game is at its best with four players, though the two and three player variants are playable (the 'predict your opponents' aspect of the game is the biggest loss when playing without the full four players). It's a great, though challenging game. The game can be vicious to players that don't look ahead and take everything into account, so people who prefer lighter fare should probably look elsewhere. There is a 'hidden role selection' mechanic, where the roles other players select can greatly change how your roles work out, and there are some gamers who dislike this seeming 'lack of control,' so that is another caveat. Aside from that however, this is a truly great game with an interesting theme, cute graphics, a bit of a sense of humor(in both rules and small details in the artwork), and a very deep actual game to back it up, that I strongly recommend. This is truly an upper level game, so don't introduce non-gamers to this immediately. If you're into deep, complex games,you need to check this one out. My wife and I loved it, and I'm surprised that she wasn't turned off by the vastness of it. Maybe because she won...The game has awesome components, humorous content, and a world of strategy. Enjoy! This is a great worker placement game. At the end of all the careful planning you get a nice assault from the good guys. Such a great game and awesome theme.